Ashley Deary dribbles the ball. The senior guard finished Thursday's contest with 12 points, six assists and five steals but couldn't lead Northwestern to victory. Northwestern’s grueling three-game road trip — with competitive contests in three different states in six days — was never going to be easy. Still, it’s hard to imagine it going any worse. The weary Wildcats (17-9, 6-7 Big Ten) were no match for Iowa (16-10, 7-6) on Thursday, falling 78-59 to close the away stretch 0-3 and drop their fourth-straight game. The loss likely extinguished NU’s slim odds for an at-large tournament berth. Senior forward Nia Coffey led all scorers with 21 points and senior guard Ashley Deary added 12 more, but Hawkeyes forward Megan Gustafson scored 17 points to lead a balanced Iowa attack that saw eight different players score at least 5 points. It was a game of sharp offensive contrasts. The Hawkeyes’ leading scorers carried their team but had significant help from their role players, and Iowa shot a respectable 42 percent from the field and took full advantage of free throws, hitting 22-of-26 at the line. NU, meanwhile, got solid contributions from Coffey and Deary but little from its secondary scoring options. Senior guard Christen Inman, for example, was held scoreless as she continues to struggle in her return from injury, and senior forward Lauren Douglas went 0-of-7 from the field. As a team, the Cats shot just 31 percent from the floor and attempted only 11 free throws. Still, McKeown didn’t want to blame his team’s woes on their taxing travel schedule. Iowa thoroughly outclassed NU in most statistical categories — rebounds, second chance points, fouls — and never trailed. The Cats cut into several Hawkeyes leads, like an early 15-4 margin that NU turned into a 1-point deficit, but Iowa pulled away each time. Such was the case in the third quarter, when NU pulled within 6 points midway through the period but then went scoreless for nearly four minutes as the Hawkeyes quickly built an 18-point edge, their largest of the game to that point. The hosts eventually led by as many as 21. Though Thursday’s loss unfolded in a different manner than the Cats’ previous three, it did have several similarities. NU took on, more or less, an evenly matched opponent — also desperate for a win — and played well in stretches. But the Cats eventually wilted, just like all but their first game in February, and finished the game with an ugly offensive stat line. 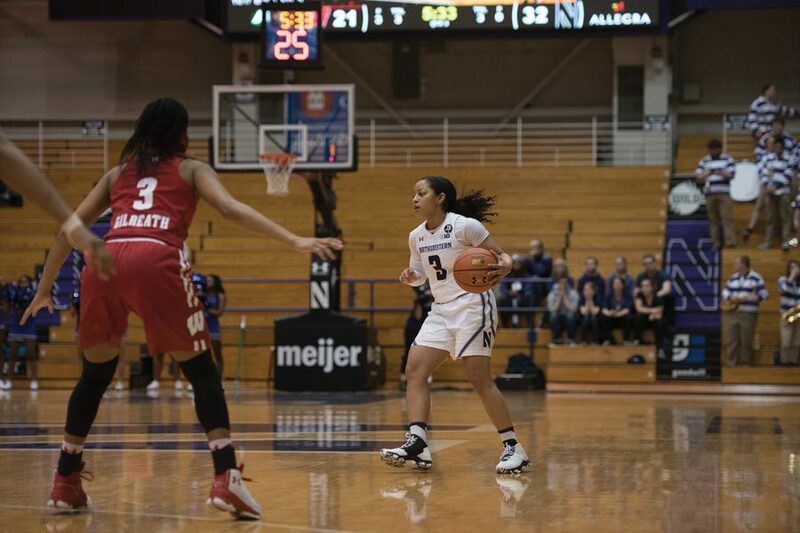 It has been a sharp fall for NU, which sat firmly in fourth place in the Big Ten and on the right side of the tournament bubble before a disappointing home loss to mediocre Penn State on Feb. 5. Then came the road trip, which offered the Cats a chance to bolster their resume with wins away from home against fellow tournament contenders Indiana and Iowa. Instead, NU enters its final two home games against bottom-feeding Illinois and Rutgers in the middle of the conference pack, playing primarily for pride and to sort out its Big Ten Tournament seeding. The Cats will also honor their five seniors before meeting the Fighting Illini on Sunday. This story was updated at 10:38 p.m. with quotes.